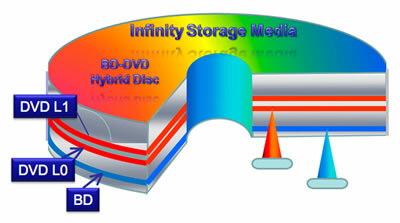 Infinity storage media, the Japanese famous disc manufacturer has just announced the plan to commercialize the world’s first hybrid Blu-ray and DVD available for public. The new technology, which embeds both Blu-ray and DVD compatible contents on the same disc is believed to be able to smoothen the migration process from DVD to most desired full HD (High Definition) Blu-ray standard especially for those users that still stick with existing DVD standard. The benefit is obvious, now users will be able to run the same copy of DVD disc in both conventional DVD players and Blu-ray players without worrying about the old favorite movies compatibility with new Blu-ray machines. The mechanism behind is it is based on the different laser wavelength that can penetrate into different layers (isolated by semi-reflective film) embedded in the disc to read DVD and Blu-ray media contents respectively. For instance, it reflects blue light on upper layer for Blu-ray contents readings while able to pass through red light to the DVD layer underneath. Before its official release, the manufacturer has tested and confirmed that its new combo DVD is compatible with 64 different DVD and Blu-ray players and so far the results are quite promising with almost 99 percent of them passed the tests. Don’t expect it to be cheap since it is the first hybrid release, one set of movie with four hybrid discs is estimated to cost around 36540 yen ($406). The first release will be commercialized in February 2009.